When it comes to razors I tend to go for no frills sensitive men's ones as they're cheap and have lots of blades to get the job done quickly. However, having tested the new BIC Soleil 'Lady' razors over the past month, I might have to rethink my hair removal options. These razors have shaver grip technology to help prevent you from dropping them when your hands are wet from the shower or bath. They still have the multiple blades (three or four depending on which type you opt for) that you get from men's razors, but they come in bright, sunny colours and have a moisturising strip infused with aloe vera and vitamin e to help prevent irritation and razor burn. 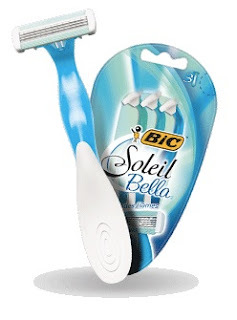 I took one 'Lady' razor on holiday with me and used it virtually every day for two weeks. I was beyond impressed that the lubricating strip didn't wear away or flake off in all that time. They usually only last about two days! To celebrate the launch of the new range, BIC have created a Facebook page on which they'll be giving away a host of weekly prizes. They've already sent one lucky person on a trip to New York! To enter, simply 'Like' the BIC Facebook page and answer the weekly questions. The Facebook page is also the place to share beauty hints and tips. Visit facebook.com/BICSoleilJustLive to join the fun. You can even follow on Twitter: twitter.com/SoleilJustlive. Suddenly shaving your legs seems a little less dull!